Relocating your office from A to B, can be a rather stressful and hectic time, much like any other property removal. There are certain specific issues and considerations to be accounted for when it comes to moving your place of business to another location. We at Office Removals Arnos Grove can provide you with a highly comprehensive, professional office removal service that covers all aspects of the removal, from discussing your requirements and expectations to distributing of boxes and items at your new address. Our understanding of a good quality office removal service that is worth your time and money is rather straightforward, and that is to be able to deal with all stages of the relocation and provide you with punctual and attentive service which doesn’t cause damage to any items and doesn’t cause the business any costly delays or errors. Although this sounds rather simplistic, keeping up the good work is not easy, and takes a lot of effort, training and persistency on our behalf. The people that make it happen on ground level are our expertly trained, professional movers who have the necessary experience and the required practical skills to deal with any type of office removal with professional pace and efficiency. The mover teams are diligent and well organised, they will quickly distribute tasks amongst them upon arrival to your address, and commence work immediately. We appreciate the fact that every hour of downtime translates to lost profits and missed customers for your business, therefore we aim to complete the entire removal within the shortest time possible and with minimum disruption to your busy daily schedule. You don’t need to worry about damage or misplacement of expensive office equipment, machinery and furniture as our movers will be extra careful and cautious when handling such items. By hiring Removal 24, you are guaranteed to enjoy risk-free office relocation in N11, N14 Arnos Grove. Our staff is well trained and are able to provide you with first-class assistance at any day of the week. The moving vehicles in which we have invested are new, clean, insured and they have safety gear that will prevent your items from any damages during the time they are on the road. Our punctual office removals in Arnos Grove comply with all standards. Office Removals Arnos Grove will deal with packing, securing and labelling of items to be moved, so you don’t have to. We own and operate a fleet of well-maintained transport vehicles which ensures safe, timely and efficient transportation of your office contents. This reduces service costs incurred by customers even more! Arnos Grove is sitting in the London Borough of Enfield. 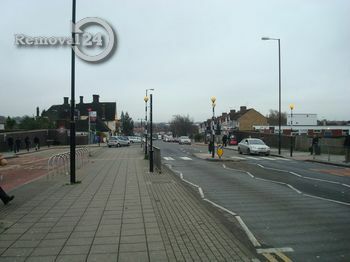 It is home to a park which is also known as Arnos Grove. The park covers 44 acres and it has a few tennis courts. Compared to other areas in the same London region, Arnos Grove’s development started rather late – in the 1930s. That is why it was viewed as being a small part of Southgate for a few decades of the 20th century.